The article below is one of the more interesting, entertaining and eye-opening pieces on exports of services that I have seen in a long time. It pinpoints ways for our economy to power its way out of the recession by focusing on export-generating activities we do not usually associate with traditional exports of goods and services. U.S. based activities such as tourism, education and sales of licensed sports apparel to foreign visitors, not only account for a substantial portion of our nation’s export totals, but also help build the Americana brand globally. This type of brand development is circular and very beneficial to the long-term competitiveness of the U.S. in the global markets. As services such as U.S. sports, education, pop culture, are delivered to tourists, students and TV viewers/Internet users across the world, more demand is created within foreign markets for all things American. This in turn benefits the U.S. exporters of physical goods and professional services. It also benefits the U.S. franchisors in sectors such as education, food and beverage and childcare, who, as part of their franchising efforts, not only export the know-how, training and physical merchandise, but also the slices of the American way of life. Such exposure, in turn, fuels additional interest and demand for the American life-style in the foreign countries and generates more tourists, buyers of licensed merchandise and students who vie for placement in American colleges and universities. And on and on it goes. Thus it is important that our nation understands the importance of the seemingly unconnected activities such as tourists waiting in lines to visit Disney World, or buy NBA licensing apparel, Apple computers and Juicy clothes, or students coming to the U.S. to study. Both government officials and private business people need to realize how these “non-traditional exports” fit into the long-term economic health of our country and do everything they can to contribute to their growth and promotion. As always, I hope you enjoy the article and welcome your comments. The U.S. runs a huge trade surplus in tourism, tuition paid by foreign students, even NBA jerseys sold abroad. Linsanity swept the nation last week. The undrafted Harvard graduate Jeremy Lin seemed to transform himself from benchwarmer to MVP candidate in a matter of days. 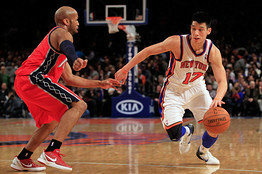 New York Knicks #17 jerseys became the biggest seller in the NBA and interest in Mr. Lin surged world-wide. That same week we learned that China’s president-to-be, Xi Jinping, is an NBA fan. After meeting President Obama at the White House, Mr. Xi traveled to Iowa and then attended a Lakers game in Los Angeles. Mr. Obama, for his part, visited a Boeing 787 plant to tout exports as an engine of growth. Though seemingly unrelated, these three events together highlighted one of the more promising ways out of our economic doldrums: growing exports—with exports broadly defined to include things like entertainment royalties, tourism, travel and services. While U.S. economic conditions have improved in recent months, anxiety lingers and the slumps in housing and consumer spending remain. Exports, however, have grown impressively and have plenty of room to keep expanding. During our last economic expansion, we focused on the home market while the other advanced economies’ exports grew three times faster than ours did. Big emerging markets grew even more. Today, growing exports are a natural opportunity for us and one of the last areas of bipartisan agreement in Washington. And exports are not confined to traditional manufactured goods. When a foreign visitor comes to America on vacation and, like Mr. Xi, buys an NBA ticket in Los Angeles or a lunch in Muscatine, Iowa, those count in official statistics as exports. If a fan in Indonesia watches an NBA game or buys a Jeremy Lin jersey, the royalties count as an export. Many services increase our exports: tuition paid by foreign students, fares paid on U.S. airlines by foreign fliers, ad sales on Google from foreign companies. These things add up. Last year, according to the Bureau of Economic Analysis (BEA), the U.S. exported $2.1 trillion of goods and services (the most ever) and more than $600 billion of that came from services. Jeremy Lin, right, of the New York Knicks playing against Sundiata Gaines of the New Jersey Nets at Madison Square Garden on Monday. Think of them as the New Exports. We already export far more of them than any other country. We export more educations than computers and more tourism than aerospace products or machinery. Unlike our massive trade deficit in goods, we run major trade surpluses in the New Exports—$179 billion of surplus in 2011 and probably more in 2012, according to the BEA. This supports millions of jobs across America. Promoting the New Exports requires more than just the conventional prying open of foreign markets and reducing tariff and regulatory barriers to our goods. It involves fighting restrictions on Internet commerce and enforcing intellectual-property rules. It also involves some less confrontational (and often easier) strategies such as improving foreigners’ opinions of America so they want to come visit or send their children to school here, and then expanding student and tourist visas to enable them to do so. Modest investments can facilitate major private-sector economic gains. Take tourists coming from countries like Brazil. In a recent survey, 94% of Brazilians said it was either difficult or nearly impossible to get here. To obtain a visa, they must undergo a multi-stage ordeal that includes traveling to a personal interview in a city with a U.S. consulate—of which there are only four in all of Brazil. Start to finish, the process can take up to five months. Last month President Obama called for speeding up the visa process to promote tourism here. The U.S. Travel Association estimates that adding a consular official costs, with overhead, around $280,000 per year. Since the average Brazilian traveler to the U.S. spends around $5,000, the association estimates that a single official can generate as much as $50 million of travel exports for U.S. business (not to mention more than $1 million in visa fees to the U.S. government). Supporting New Exports doesn’t require diplomatic battles with China or shepherding new trade agreements through Congress. These are exports that other countries want us to have and that we have missed by our own short-sightedness. Last week we extended the payroll tax cut to help the economy. We have given tax incentives to encourage companies to invest. Why not also use short-run government incentives to encourage New Exports, such as limited-time discounts on airline taxes, visa-application costs and airport-landing fees? As a Chicago Bulls fan, I find the resurgent Knicks irritating. Still, I will root for more Linsanity because with every game watched in Asia, jersey sold in Europe or visit to an NBA game by a foreign tourist, this young man is doing more than just helping his team. He’s demonstrating a way for our economy to grow. Playing for a .500 team, Mr. Lin probably won’t be up there cutting down the nets in celebration at the end of the year. He was an economics major, though, so if it’s any consolation to him, he’s already helped cut down the trade deficit. Mr. Goolsbee, a professor of economics at the University of Chicago’s Booth School of Business, was chairman of President Obama’s Council of Economic Advisers from 2010 to 2011. As part of our efforts to bring you more relevant and diverse content, I am pleased to announce the launch of Risk Management section on the Fluent In Foreign blog. This section will deal with subjects of political risk, export credit risk, vicarious liability protection, corporate and personal security, travel and medical insurance and protection of cargo and investment. The Risk Management section follows the Exporter’s Tax Corner as the second section into which outside experts, who are part of the Fluent In Foreign network, contribute valuable insights. Additional sections on International Franchising, Compliance, Financing, International Accounting and Documentation Processing will be added over the next few weeks, so please stay tuned. I am pleased to welcome Mr. Daniel Wagner as the first contributor to the Risk Management section. Mr. Wagner is a highly regarded author and expert on political risk insurance. Daniel has been a frequent speaker at the Fluent In Foreign and other international events and has always been very well received by the audiences for his ability to make difficult and often mundane subject matter of Political Risk Insurance accessible and fun. This week Daniel opines on the subject of political forecasting. I hope you enjoy the article and as always welcome your comments. As global politics continue to gyrate, the pace of change poses ever greater challenges to accurately predicting the future. Many forecasters have gotten into the habit of declaring – ex post facto – that they got “it” right, when in fact they failed to accurately predict the course of events. Given the multifaceted nature of the world today, predicting the future is quickly becoming a fool’s game, and calls for a new paradigm. Today’s oracles confront a dizzying array of information in an attempt to make sense of the future. Looking for precedents in unprecedented times exposes the shortcomings of managing risk by looking in the rear view mirror. It has gotten to the point where there is so much information out there, it is impossible to consume it all. And yet, most of this information is little more than a regurgitation of news, and dated analysis – which is often passé as soon as it is produced. Yet, the average consumer of such information rarely recognizes the difference because they don’t have the luxury of spending enough time-consuming the information. for more go to the Risk Management page – http://wp.me/P1iIhX-7j . As seen in this month’s issue of The New York Enterprise Report. During one of my first trips abroad, my partner and I were sitting in the lobby of a Moscow hotel, people-watching and wondering how to go about finding customers for our newly established, fledgling communications distribution business. Hearing the familiar English dialogue, one of the patrons approached us and we struck up a conversation. He turned out to be a mid-level executive working for one of the major Canadian oil companies drilling for oil in Northern Russia, just inside the Polar circle. After finding out about our business, he gasped. As it turned out, his company was having a very difficult time both sourcing the needed equipment locally and getting licenses to import the required equipment from abroad. Shortly after, this gentleman’s company became one of our first clients and we continued to serve them for years. Since the expat community was tightly knit, the word soon spread, and within six months we were supplying every major Canadian and US oil company with radio communications. Opportunities to find clients abroad could come from anywhere and you should always be ready to convert a chance encounter into a sale. Of course, you can’t rely on hanging out in hotel lobbies waiting for orders. Finding customers abroad is a multistep process, which should start with advance preparation at home. Establish email or telephone contact with the U.S. Commercial Service, the local embassy of the foreign country, and the American Chamber of Commerce (AmCham) in your target country abroad, and introduce your organization, as well as its products or services. Use this process to seek guidance on overall demand, competition, ease of importation, and any specific taxes or other burdens that may or may not be in place to hamper or facilitate importation into your chosen country. For example, in some countries, the duties on used car importation are set artificially high, purposely crippling natural demand. In other cases, duties on alternative energy equipment imports are completely removed to stimulate the segment’s growth. Once you determine the landscape for demand and pricing of your product or service, the next step is to inquire about necessary government registrations and localization requirements (translating manuals, adopting electrical voltage, etc.). Find out about local industry associations and trade shows where you can showcase your product or service. You also will want to make preliminary arrangements for service, warranty repair, and installation of your product by identifying potential partners with whom you may wish to enter into temporary arrangements, even prior to selling your first unit. Why am I spending so much time on preparatory activities, without mentioning marketing and sales? Because unless you have fully assessed your market, determined your importation routes, and planned for service and installation, you will have a very tough time even getting out of the gate. You also will cede a great degree of control and pricing leverage if you do not develop internal expertise on each target country you plan to sell your products and services in. Yes, you may have an occasional buyer or two who will order from you in the US, prepay for the product, and take care of all the arrangements. However, this kind of passive approach leads to an outcome similar to winning the lottery; it will not allow you to build a sustainable overseas sales operation—whether it is export, independent distribution, or setting up your company’s own points of presence abroad. Once you’ve laid the groundwork, it’s time to find customers. Working through distributors or agents is the most common approach. Good sources for distributor candidates are local associations, chambers of commerce, and US trade shows, which oftentimes have potential customers from foreign countries who come as part of U.S. Commercial Service trade missions. Developing a strong distributor support program will allow your company to attract strong distributor candidates, including companies selling competitive or related products, and it may also attract new players. The program should include extensive training for the distributor’s personnel on your company’s products and corporate culture, and financial incentives for the distributor to advertise and market your company’s products or services. You also should put in place a multi-buyer credit insurance policy for your target country to help the distributor extend open terms to local buyers and financial assistance in helping the distributor defray initial product certification costs. This could be either in the form of a cash rebate or a predetermined amount of goods or services at a reduced cost. Once you have selected your company’s local representative distributor or agent, it is time to kick the search for clients into high gear—it’s time to start local marketing and PR efforts. These efforts should include a joint sales trip where your senior sales executive should accompany the local rep on a one- to two-week-long sales junket to call on key customers, pertinent government ministry and municipal departments, local law and accounting firms, as well as members of the expat community who have longstanding experience in the country and should be cultivated as referral sources. Upon return, follow up. Don’t be discouraged if you receive no reply to your thank you letters, some cultures have a different communications framework. Be patient. Your potential clients need to perceive your company as committed to their market. Participate in local trade shows, stage interim training and update sessions, invite potential customers for picnics and networking events. Listen to them and listen to them some more. 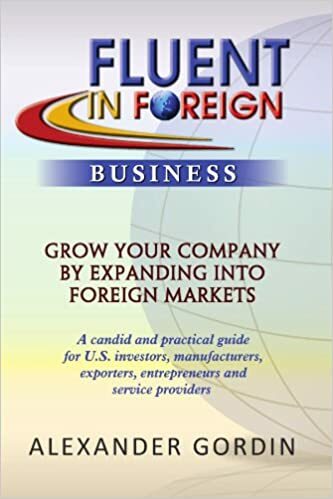 If your company’s product or service is competitive, once they perceive you and your representatives as committed for the long haul, your business in your chosen country will blossom.